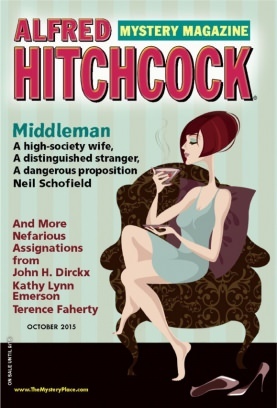 "Solo for Shoehorn," by John H. Dirckx, in Alfred Hitchcock's Mystery Magazine, October 2015. For many years Dirckx has been creating a dependable series of private eye stories for AHMM about Detective (recently Lieutenant) Cyrus Auburn, set in a midwestern city. The tale begins when Auburn meets Walter Bottrace, a seventy-five year old man with a mobile van full of vintage LPs and 45s for sale. 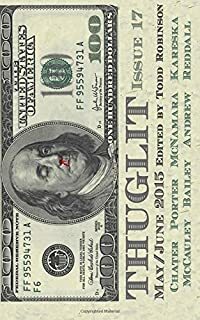 When Bottrace is found killed in the woods with a passel of fake IDs, Auburn uncovers a complicated scheme of robberies that have more to do with drugs and, yes, shoehorns, than music. What makes the stories work are mostly the characters and how they are described. There is a regular cast, each of whom gets their scene on stage. For example, evidence tech Kestrel dislikes Stamaty, the coroner's clerk who slows down his work, and in this episode he calls him "the Last Responder." "Big Hard Squall," by Lane Kareska, in Thuglit, issue 17, 2015. This review is late because I was at Sasquan, where, among other things, I heard two editors being interviewed. They were asked: what type of story are you so tired of you don't want to see any more? They refused to answer because (and I am paraphrasing, of course), no matter how cliched a category might be, someone is going to come up with the next new and original work in it, and they don't want to miss it. This week's story starts with a bit of a cliche: The main character has been brutally attacked and locked in the trunk of her car, which is now headed for parts unknown. We stay in Abby's head as she runs through her life and concludes that there is no one who would want to do this to her. Therefore the target must be her daughter Margaret, a prosecuting attorney. Either someone wants to punish Margaret or else put a squeeze on her, and Abby is the pawn in jeopardy. Back to the plot. So far we are in territory we have seen many times before. But when the trunk lid comes up, all bets are off. Nothing after that is predictable at all. Very nice piece of work. A Box of Horses, by Steve Bailey. "A Box of Horses," by Steve Bailey, in Thuglit", 17, 2015. Some stories you read on the edge of your seat, not because of the suspense in the telling, but because there are so many ways the author could go wrong. Will he make it to the end without screwing up? Obviously Steve Bailey did or we wouldn't be having this discussion. Dianne is a woman who does bad things. She has her reasons, ugly events that happened in her past. She makes her living cleaning people's houses and she is "an explorer, a secret digger inside people's hidden places." Yes, she steals from her clients, but she is much more interested in investigating their lives than in copping their goods, which in any case she is more likely to keep as souvenirs than to sell. One day she discovers that a client - a woman with MS and her nine-year-old daughter - have a new neighbor, and she immediately recognizes that this man is in some ways like her. Up to no good. And maybe now she knows why several young girls in the city have vanished in the last year. Trouble is, he also recognizes her for what she is... And you think YOUR relationships are problematic. "Shooting Stars," by Richard Helms, in Ellery Queen's Mystery Magazine, September/October 2015. Even after the crime-scene guys finished wrecking it, Nigel Bowles's trailer looked nicer than my apartment. Lovely. Bowles is, or was, the favorite judge on a top TV talent show, visiting town to film a special episode. Everyone involved in the series had multiple reasons to want him dead, and most had opportunities. But that isn't Boatright's real problem. That would be the fact that one of the other judges is a client of an alleged psychic with the amazing name of Bowie Crapster, and he is the reason Boyright keeps threatening to retire. Forced, again to work with the Crapster - No more than five and a half feet tall, built like the Pillsbury Doughboy, resplendent in an Italian ice-cream suit with silk cravat and gleaming white patent-leather shoes. His hair, cut in a sort of Caesar style with short bleached bangs, was reflected in his silver Elvis sunglasses. He looked like a Good Humor Man in Key West. - our hero threatens to resign , but that would spoil the fun. Crapster isn't quite as charmingly annoying this time, largely because he explains to Boatright and us how he achieves some of his allegedly mystical effects. A nice example of working your way through the suspects. One complaint: Helms is stuck with the names he chose for his heroes but with so many letters in the alphabet why does this story include: Boy Boatwright, Bowie, Belinda, Billy, Baggs, and Bliss? Why make it harder for the reader to keep the characters straight? The nominees for the Ned Kelly Awards for best Australian crime fiction have been announced. Congratulations to all the short story nominees! 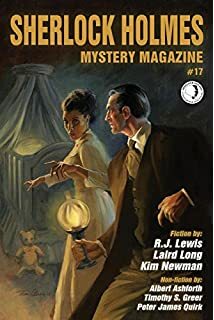 "Red Jacks Wild," by Kim Newman, in Sherlock Holmes Mystery Magazine, Issue 17, 2015. You could argue that this is not the best mystery story I read this week. At approximately ten thousand words it's more like a novella. And you could say it's fantasy/horror rather than mystery. In any case, it's in a mystery magazine, and a series of murders are solved, and if you don't like that you can start your own review blog. So there. I try not to reveal the plot but there is a lot of premise here to explain before we get to the plot. The narrator is John Carmody, a psychologist in New York in 1951. He also happens to be Jack the Ripper. Wait a minute, you say. He'd have to be a hundred years old. Well, he is. But he looks the same age he did in the 1880s when he started making human sacrifices to Hecate. Which he still does, every three years. But not prostitutes every time. He alters his "disposables-" And now we come to the first thing I love about this story. You may be familiar with the theory that popular horror movies are the ones that capture the zeitgeist - I might say the frightgeist - the main thing that people of the time are scared of. So right after World War II we had Godzilla and other monsters created by nuclear radiation. At the height of the Cold War we had Invasion of the Body Snatchers in which your best friend or neighbor might turn out to be the enemy! When AIDS made blood a scary thing Dracula made a big comeback. I lieave it up to you to decide what the current popularity of brain-seeking zombies means. My point is that this Jack the Ripper understands the concept. Carmody picks the people we don't care about. And, as the FBI's favorite shrink, he gets to steer them to the wrong killers. But now someone is slaughtering juvenile delinquents - surely a classic "disposable" in America of the 1950s - and it isn't him. It seems to have something to do with his most famous patient, a publisher of horror comics, who is being tormented by another psychoanalyst, who blames the comics for all the nations ills. Yes, this story is all about America's twisted psyche, and I loved it.